Halo Thermal Imaging, based at Durham Tees Valley Airport recently launched the first true, hands-free thermal imaging camera at the Interschutz tradeshow in Hannover, Germany. The Halo is is a game changer for the industry, providing firefighters and first responders with the freedom for versatility required in hostile environments. With its patentable technology; it’s the future of firefighting. 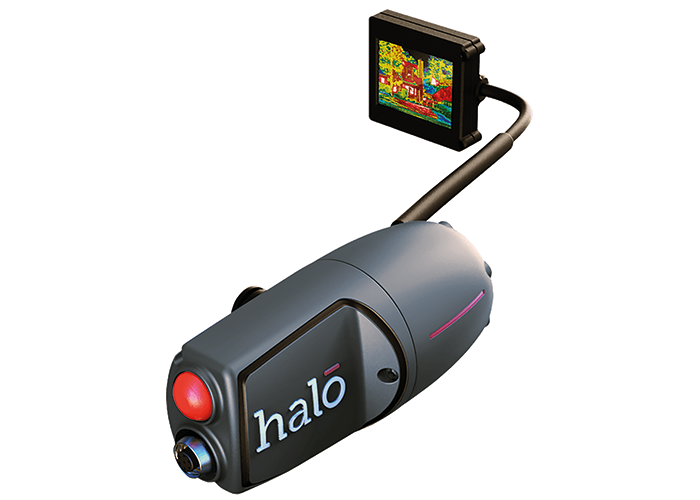 The Halo is the world’s smallest and lightest camera built for firefighting and search and rescue. Attaching the camera to a firefighters helmet, in the same manner as a torch, gives the user the ability to use both hands with The Halo providing crystal clear images. Weighing in at just 390g, The Halo also features a 10-hour battery life, 2.5” high definition display, snap shot function and superior dynamic range. When temperature is important to the wearer, spot temperature measurement and multi colour maps are available as standard with a single button configuration making for very simple operation.